Seesaws allows kids all over to embrace the simple fun found on the playground. The welcoming Spring Seesaw is a traditional playground component which focuses on improving balance, spatial awareness and interaction. Safe and efficient, the body of the Spring Seesaw is constructed with thick 5" galvanized, powder-coated steel piping and it is supported by a large 6"O.D. steel tempered spring. The large, centered spring provides a more controlled rocking motion and easy access for children entering and exiting the Seesaw. Two rounded molded polyethylene seats with hand and foot rails enhance the safety of the Spring Seesaw. 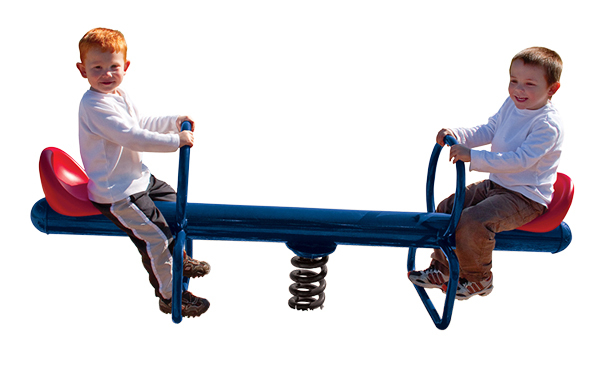 The highly durable, weather resistant Spring Seesaw is a valuable addition to school playgrounds, parks and daycare facilities.